Join us for a hands-on introduction to the rare carbon transfer process! 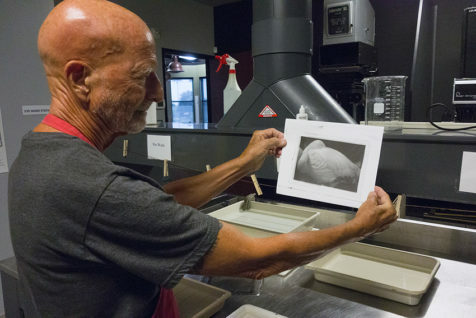 In this alternative photographic process, finely ground pigment creates a unique image quality and tonal range. The prints beg to be held in your hands to appreciate their texture and reflection of light. Though carbon printing is notoriously difficult, with this class you can learn from a contemporary practitioner who has ironed out all the kinks. Dennis Collins has spent years perfecting his process, and now would like to share his knowledge with you! The skills acquired in this class will provide you with the knowledge necessary to explore the possibilities of your artwork in this medium. This class is open to photographers of all levels, though some darkroom practice is beneficial. Prior to the workshop students will need to provide a digital image containing highlight, mid-tone and shadow detail from which a digital image will be made for contact printing the size of a 4×5 print. More details will be provided upon registration. Students will take home a glass and squeegee set at the end of the workshop to continue their exploration of carbon printing at home. With over 30 years of experience as a Corporate Photographer, Dennis Collins’ interests now lie in the timeless beauty of carbon printing. While earning a Bachelor of Fine Arts Degree from the Center for Creative Studies in Detroit, Michigan he focused on alternative processes. Dennis has painstakingly embraced carbon printing, a particularly difficult and rare process, and he passionately wants to share this knowledge with others in the hope this art form will continue. When not in the darkroom, Dennis enjoys spending time with his family, volunteering at Art Intersection and Infinity Hospice, and car racing.